Indebted families scale back to avoid taking on more holiday debt. The holidays are hard on any budget, but that financial stress is compounded when the household is already facing challenges with debt. With that in mind, Consolidated Credit surveyed over 2,500 people who have reached out to them for help to see how they’re doing at budgeting and spending this holiday season. The results show that the majority of these families who have already stared down the hard road toward freedom from debt are scaling back this year in order to avoid adding to their financial stress. As a result, 89 percent plan to spend less this holiday season, doing everything from scale back on entertainment budgets to limiting the number of people to gift. According to additional survey results, two in five indebted families (40 percent) will spend the 80 percent or more of their total holiday budget on gifts, with only the remaining 20 percent to cover things like entertainment and travel. These families who’ve already learned how burdensome credit card debt can be have found smart ways to avoid end-of-year debt. In fact, 23 percent have shopped throughout the year to avoid holiday debt here in December. The survey results did reveal a few financial behaviors that should land some indebted families on Santa’s financially naughty list. Do you plan to spend more or less this year? If you plan to spend MORE, why? If you plan to spend LESS, why? What percentage will be used for gift giving? How many people are you shopping for? 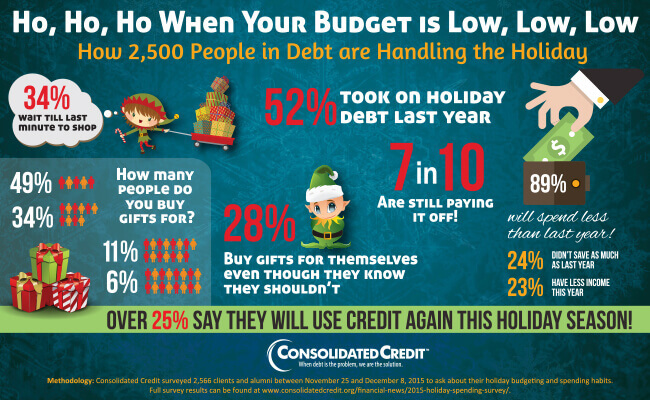 Did you incur debt last holiday season? If so, are you still paying off last year’s debt? How do you plan to pay for the holidays? When do you do the bulk of your shopping? Will you buy any gifts for yourself? How much of your budget will be used for entertaining? Will you travel this holiday season? How much of your budget will be used on travel?